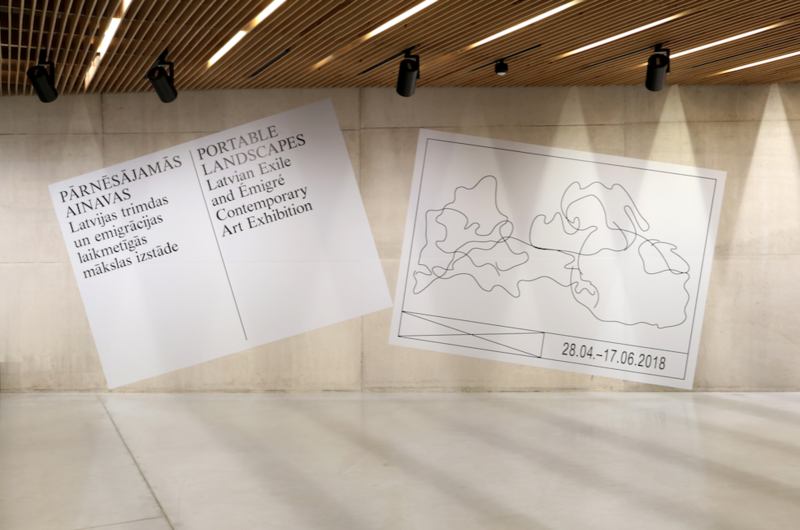 The international exhibition series Portable Landscapes is a new research project on processes of art and life within Latvian exile and emigrant communities from the beginning of the twentieth century until today. Following the lifelines of a number of artistic protagonists, the series explores the major centers of the Latvian diaspora: Paris, New York, West-Berlin, Montreal, and the Swedish island of Gotland. By relating individual stories and chapters of migration to a common network situated within the broader context of twentieth-century art history and wider processes of migration and globalization, the project aims to create an understanding of our contemporary world that is informed by these historical events. From 2017 to the end of 2019, the Latvian Centre for Contemporary Art works with a wide range of international institutions, researchers, curators, and artists to create five “chapter” exhibitions in Paris, Gotland, Berlin, Canada, and New York. A sixth exhibition at the Latvian National Museum of Art in Riga from 24 April to 17 June 2018 will gather in Latvia all of the positions into one space. Additionally, Portable Landscapes: Art Histories of Latvian Exile—the project’s anthology developed in collaboration with Berlin-based publisher K. Verlag (forthcoming, 2019)—weaves together all of the project’s chapters with supplemental material and philosophical reflections. Each chapter exhibition of Portable Landscapes centers on a personality or a group of people whose life and work is examined both as reflective of a specific period in the history of Latvia and as a prism through which to consider current affairs—in Latvia and transnationally. Taking place from 13 January 2018 until 24 March 2018, the first of these exhibitions takes place at Villa Vassilieff in Paris. Here, Latvian dancer and publicist Aia Bertrand is the central protagonist; together with her husband, the American dancer and artist Raymond Duncan, Bertrand directed Akademia, a living community and institution for alternative education active in Paris from the 1910s–70s. Presented in July 2018, the Gotland story departs from the work and biography of Latvian painter Laris Strunke. A refugee during World War II, he escaped from the Red Army with his family by illegally crossing the Baltic Sea to reach Gotland, also known as the “Island of Hope” for many Baltic citizens during the period of Soviet occupation. The Berlin exhibition, planned for early 2019, will focus on Valdis Āboliņš—a leftist intellectual and a mail artist whose efforts to create and strengthen the cultural ties between West-Berlin and Riga open up a lot of complex questions. A highlight of the story of Latvian artists in New York is Hell’s Kitchen—an informal group of poets and artists. This group was an important driving force for the international milieu of intellectual exiles and played a crucial role for the survival of the creative potential of Latvian culture during the 1950s and 60s. In Canada the research follows the life and work of Zanis Waldheims a Latvian refugee whose enormous oeuvre of geometric abstraction is densely layered with symbolism and philosophical reflections. All exhibitions will present artworks and documentary and archival materials highlighting selected historic protagonists of Latvian exile. These elements are complemented by new commissions and existing works by other artists from Latvia and abroad addressing topics such as migration, exile, and belonging from different angles and in a variety of media. Portable Landscapes is a unique opportunity to introduce Latvian artists living abroad in various epochs, contexts, and circumstances. The project also seeks to broaden our understanding of recent history through a set of minor histories that relate to one of the world’s most urgent contemporary concerns: the struggles posed by migration and expulsion. Portable Landscapes: Art Histories of Latvian Exile.Mika Hannula, Ingela Johansson, Solvita Krese, Juris Kronbergs, Mart Kuldkepp, Inga Lāce, Elisabeth Lebovici, Marcus Lutyens, Thomas Nail, Marco Pasi, Diāna Popova, Antra Priede–Krievkalne, Bart Pushaw, Melissa Rachleff Burtt, Maruta Schmit, Andra Silapētere, and Jacob Wren. Design by Kārlis Krecers. Portable Landscapes is one of the events of the Latvia’s Centenary Celebrations. It is supported by the Latvian Culture Ministry; the State Culture Capital foundation; Frame Contemporary Art Finland; Iaspis; the Embassy of Canada; the Embassy of the USA; the Embassy of Sweden; and, Goethe-Institut, Riga.